I haven&apos;t knit a Monstapus in awhile. To remedy that, I knit three! All of them are staring at me and they are all adorable. Too cute, really. But I&apos;m their mom and my judgement may be a little biased. All three Monstapi will be available to purchase at my next show on September 8th at the Buffalo Central Wharf. It goes 10-5! Now... What else should I make this week? I always welcome custom orders! If you see anything you like feel free to email me. 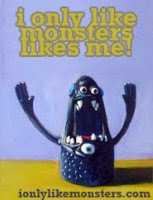 I can make you any monster your heart desires. This guy belongs to Kenzie and will be in the mail tomorrow! Just wait to you all see what I&apos;m working on for Margaret!